A man accused of setting off bombs in New Jersey and New York, injuring more than 30 people, pleaded not guilty to charges he tried to kill police officers in New Jersey before they captured him last month. Ahmad Rahimi appeared in the court hearing in Elizabeth via video from his hospital bed Thursday afternoon. His head was propped up on pillows, while public defender Peter Liguori stood by his side wearing a disposable hospital gown and plastic gloves. Liguori -- who corrected the spelling of his name from Rahami, which has been used by media and law enforcement since the Sept. 17 bombings -- entered not guilty pleas for all state charges levied against the man. He's charged with five counts of attempted murder of a police officer and weapons offenses in connection with the gun battle. Rahimi, an Afghan-born U.S. citizen, has been hospitalized with gunshot wounds since the police shootout that led to his capture on Sept. 19 outside a bar in Linden. Authorities have declined to provide details on Rahimi's medical condition, citing privacy laws. Officer Angel Padilla, who prosecutors say was shot by Rahimi, was in court along with fellow Linden officers. None of the suspect's family appeared at the hearing. He is also accused of detonating a pipe bomb along the route of a Marine Corps charity race in the New Jersey shore town of Seaside Park and a pressure cooker bomb in New York City on Sept. 17. No one was injured in the New Jersey blast, and 31 people were hurt in the New York blast. A second pressure cooker bomb near the first in New York did not explode. 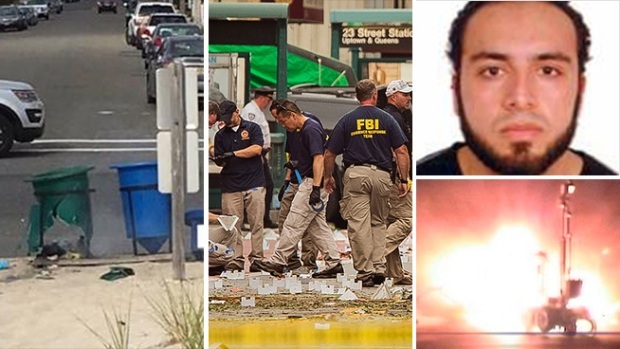 Rahimi also faces federal charges in connection with the bombings, but he would have to be moved to New York before he can be arraigned on those charges. Rahimi's public defenders have a policy of not commenting on cases.